We have been professionally serving Arizona since 2007 and insured. We are a family based business and do not hire out any DJ's. DON'T pay high prices by hiring a "TALENT AGENCY". who hire out DJ's. We DO NOT charge extra for set-up or tear down, mileage within Maricopa County, or announcements. We have a signed contract and only require a $50 deposit to reserve your date. We have many years, since 2007, of experience entertaining guests at events and can't wait to discuss your needs. 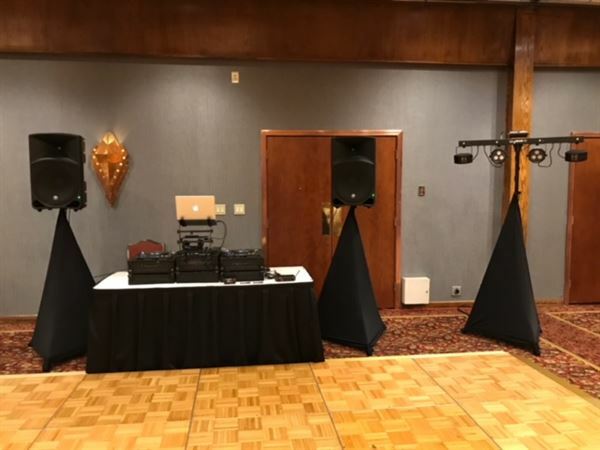 We offer a professional sound system, various LED lighting bar with sound activated lights, strobe, wash lights and lasers, up lights to match your colors, wireless microphone, and clean edited music of your choice of genres. We will work closely with you to meet your event needs and BUDGET. We feel that each event requires a personal approach, and we’ll get to know your tastes and make recommendations. We can set up a consultation, no obligation to hire, to go over your needs for your event. We have a signed contract and only require a $50.00 deposit to reserve your date and the balance due the day of your event.